A circular bronze brazier, lu, the flat base supported on four feet, each in a form of a human figure. 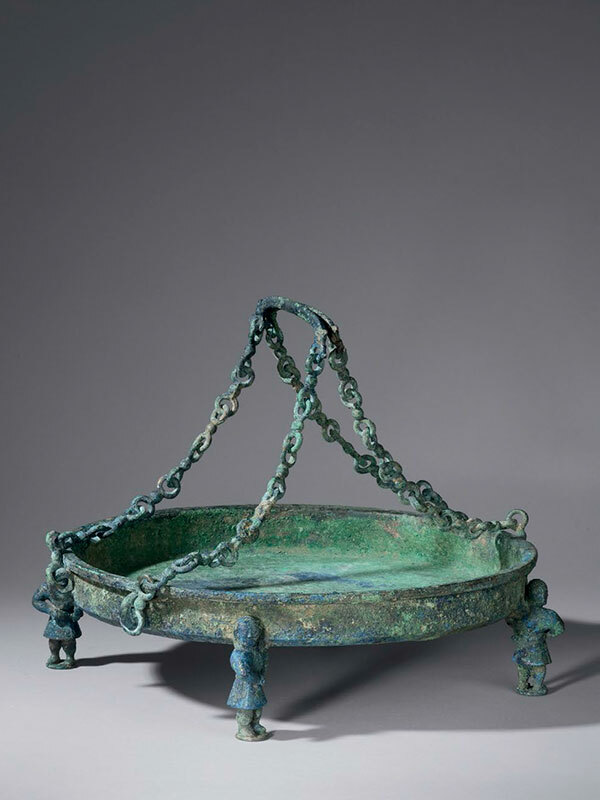 The body of the brazier is formed as a large shallow basin, with short, straight sides terminating in an everted rim. The sides of the body are fully decorated in low-relief with densely packed meanders. Chain handles applied to each side of the vessel, each consisting of double-eyed links, are joined by a yoke-shaped handle with dragon mask finials. 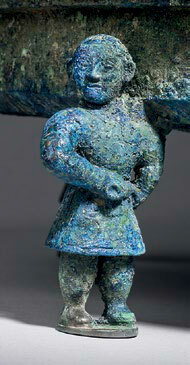 Each human figure forming the legs of the vessel is vividly cast, dressed in a long, belted robe and carrying the lower edge of the brazier on his left shoulder. The vessel has a brilliant blue and subtle grey-green patina overall.